Posted April 9th, 2016 by Mobile Music School & filed under Music Lessons, Pre-Instrumental, Singing Lessons. Mobile Music tutor Katie is having great fun teaching the wonderful students of Butterfly Montessori, who are coming along really well with their ‘Little Musicians’ programme. Katie takes two different age groups each week. Each class group gets the chance to explore the sounds of every day life, the sounds of the orchestra and the sounds of voices. Throughout the course of the programme, the children have played many musical games, learned action songs and music notation, and have also performed on percussion instruments. 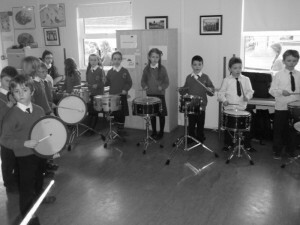 The eldest group are particularly advanced, so with each lesson they manage to cover a wide range of songs, musical games and percussion. Katie has discovered the younger group really enjoy the guitar, so she has been bringing it with her to the lessons to sing songs using the guitar. Our students have been working hard on developing their aural skills by practicing and learning a number of different songs. They practice exploring pulse, rhythm, tempo and pitch through each of these songs. These classes give children a positive musical experience, which we hope is the beginning of a long musical journey with music making! If you wish to enquire about any of our music workshops or programmes, please email us at admin@mobilmusicschool.ie or contact Shay on 087 299 5666.